While the new Windows Movie Maker does not have editing abilities as flexible or intuitive as its ancestor, it can also be used for simple editing tasks such as adding text to the video. Adding text on your video is a perfect way to make the people understand a particular scene of the story. In case you want to know how to add text in Windows Movie Maker, this article will serve as your guide. When you add text in Windows Movie Maker, you will realize that it only contains a limited amount of text option and effect. 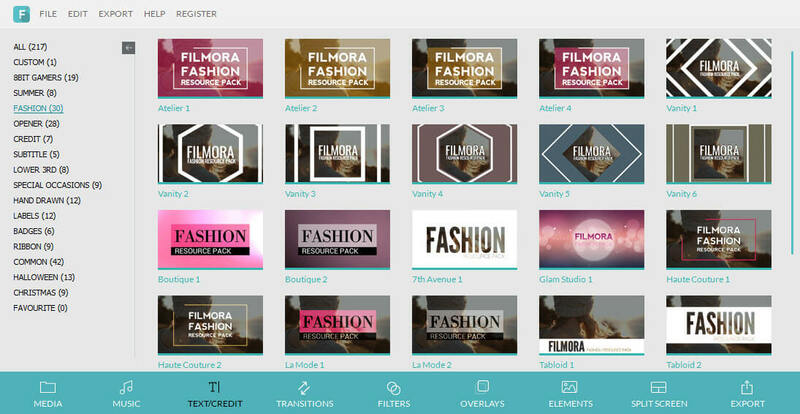 With Wondershare Filmora, you have an access to more than 200 text effects and options that will better suit your project. The effects range from fashion, summer to game. Just like Windows Movie Maker, you may also edit the text by changing the color, type the size and font. But with Wondershare Filmora, you can incorporate an animation effects to every single word. After adding the text and effects click export in order to save the video. It is a better way to create a visually stunning text on your video. In the ‘Home’ menu, there are at least 3 ways on how you can add text in Windows Movie Maker. The ‘Title’ is designed to add text before the video. You may use this to introduce the title of the video. ‘Caption’ is displayed on the video or photo. This is a great feature for adding subtitles or explanation of the video. Finally, ‘Credits’ will add a blank credit to final part of the video. If you want to edit the previous text, go to the ‘Format’ Tab and find the ‘Edit Text’. You may also simply choose the text and hit the Edit Text feature or double click the text showing on the preview and it will direct you to the ‘Format Menu’ where you can see different text tools. You may now access and alter the location, transparency, color, size and the font of the text. Besides having the capacity to add text in Windows Movie Maker, you may also apply different text effect in your text which can make them more visually appealing. To change the location of the text, you may just drag and drop it into your desired place. You may also set the start time and the duration of the text. While you were doing your work, we advise you to save your progress periodically. It will help you avoid losing your progress on the off chance that your computer shuts down while you are learning to add text in Windows Movie Maker. You have the option to save it as a movie file or as a project. In the File Menu, click the Save Movie where you can choose the different types of video format. In case you are not yet done with the video, you can save it as a project.